As you’ve guessed from the title, we’ve got another bumper weekend of boxing in store, with two notable British boxers in action and a world title (well, of sorts) on the line. 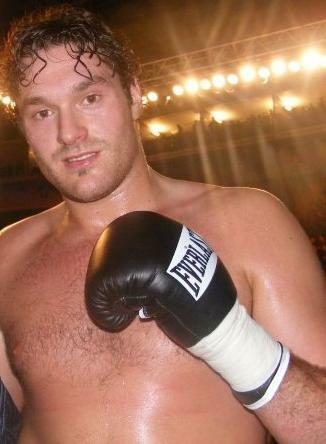 With coverage starting from 19:00 on Box Nation, Tyson Fury effectively risks his mandatory world title shot against heavyweight kingpin Vladimir Klitschko by facing Christian Hammer at London’s O2 Arena in the main event on Saturday evening. Before Fury takes on Hammer, though, we’ve got a WBA interim (I know, a ridiculous title) world title match between defending champion Dmitry Chudinov and challenger Chris Eubank Jnr. Born in Russia, Dmitry Chudinov is a 28-year-old boxer who holds an undefeated professional record of 14-0-2 (9 KO). Quite honestly, I’ve never seen him fight on TV and had to watch a couple of his bouts via You Tube (what a creation) to gain an impression of his skills, but he looks to be a decent, come-forward boxer who likes to stalk his opponents down. Of course, Gennady Golovkin is the real WBA middleweight champion, and he likes to stalk his opponents down too, but whist Chudinov can only fight who’s put in front of him and is not as far into his career as GGG is, he doesn’t look to be in the same league as the Kazak fighter, and looks like a tough but suitable opponent for Eubank Jnr. The entire boxing world is familiar with Chris Eubank Snr and a lot of the general public will be too. Like I said in the successful Saunders v Eubank Jnr betting preview, Eubank Jnr displays many of his father’s mannerisms – in and out of the ring – and looks set to be a future world champion. Eubank Jnr does, however, have a blemish on his professional boxing record after being beaten on points by Billy Jo Saunders, but this was as expected and there are some fights where you can gain as much in defeat as victory, and that was one of them. Indeed, 25-year-old, now 18-1 (13 KO) Eubank Jnr lost a close fight to a more experienced, world-class fighter and after throwing few punches and consequently losing the first few rounds in that match with Saunders, he went on to win the second half of the fight. It’s a ‘have a few more fights, win whatever title belts possible and then have a mega-fight rematch with Saunders down the line when they’re both world champions type theory’ – he can improve and come again. Chudinov is offered around 10/3 and Eubank Jnr is available at 4/11 and shortening. In terms of method of victory, Chudinov is rated at 7/1 to win by KO/TKO or DQ and the same price to win on points, while Eubank Jnr is 2/1 to win by KO/TKO or DQ, or 11/8 to win by a scorecard verdict. Eubank likes to land hard single shots, particularly uppercuts, and Chudinov’s come-forward style should therefore suit the Briton, who can sit back, pick his shots and counter. Now, the downside is that we don’t know how well Chudinov can take a punch – he looks quite tough, as most European boxers are. But, all in all, style make fights and while I’ve only taken a medium sized bet on Eubank Jnr winning within twelve rounds, at the price it’s worth a punt. I certainly expect Eubank Jnr to win the fight – he has to and surely knows it. In his last bout, Fury demolished British rival Derek Chisora slowly and methodically, eventually winning after Chisora’s corner pulled him out late in the fight – he was getting beaten up that badly. To boxing fans, this was impressive as Chisora is a good but not elite boxer and he didn’t get a ‘look in,’ it was unexpectedly one sided. The winner of that bout became number-one contender to Klitschko’s WBO title, but let’s just say that it usually take a while for such bouts to materialise, and also that – like Carl Froch eventually did with his IBF super-middleweight rather than face James DeGale – a champion can always just vacate his belt rather than face a mandatory challenger. Notably, Klitschko has a few world titles and if he gives one up he’ll still be viewed as the undisputed champion until he’s beaten in the ring. Given the above, Fury has opted to stay busy by fighting 27-year-old Christian Hammer, who is the WBO’s fourth-ranked heavyweight contender, and a few inches shorter than Fury, standing at 6ft 2 inches. Born in Romania but fighting out of Germany, Hammer has a 17-3 (10 KO) professional boxing record, with two of his three losses coming via knockout. Fury is offered around 1/14 and Hammer is available at 10/1. In terms of method of victory, Fury is available at 1/4 to win by KO/TKO or DQ, or 9/2 to win on points, while Hammer is 18/1 to win by KO/TKO or DQ, or 25/1 to win by a scorecard verdict. Fury has a lot more to lose and could easily safely outbox his opponent from distance, but it’s also important that he puts on a good performance and stops someone that’s been beaten twice by the same method in order to create further hype and public demand for his future fight with Klitschko, or indeed WBC champions Deontay Wilder. Hammer has nothing to lose and might as well try to knock the taller Fury out or he’s going to eat a stiff, hard jab all night, so if he ‘goes looking’ for Fury and doesn’t try to keep his distance then I would expect Fury to knock him out. The problem is that Fury to win by KO/TKO or DQ is just not worth betting on at 1/4, but I expect Eubank Jnr to win full stop, and also Carl Frampton to win his bout on ITV (around 9/10pm), so if you treble the three together it’s worth a punt and gives you a bet for the main event on each card. Of course, whether you do or don’t opt for a wager, have a great weekend and feel free to contact me on Twitter via @JCLaLiga if you have any questions or feedback. Perched atop the London Hilton on Park Lane, this Michelin-starred restaurant affords 360-degree views of never-ending cityscape. The interior is evocative of 1930s glamour, while the seasonally-inspired menus are based around modern French haute cuisine. 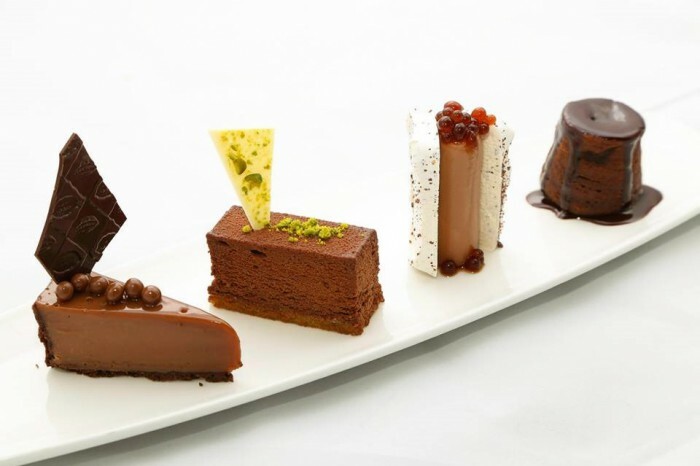 Designed to impress even the fussiest of diners, couples can choose from a seven-course taster menu which can be paired with wines or a three-course menu. Will you propose while devouring the seared Scottish scallops or the spiced apple and milk chocolate souffle? 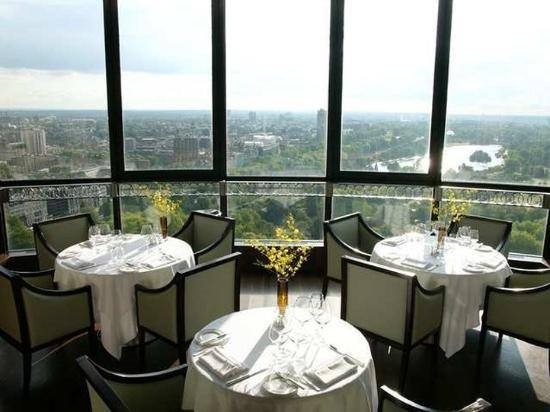 Ramp up the romance with a meal at the top of this cool London landmark. The perfect spot to put a ring on the finger of your other half, this rooftop restaurant boasts fabulous views across the Thames to Charing Cross and the City of London. Expect modern British fare with a twist as well as an extensive menu for vegetarians and vegans. If you’ve got reason to celebrate, there are more than 800 wines to choose from. For pudding, plump for the signature chocolate plate if you want your partner to agree to marry you. 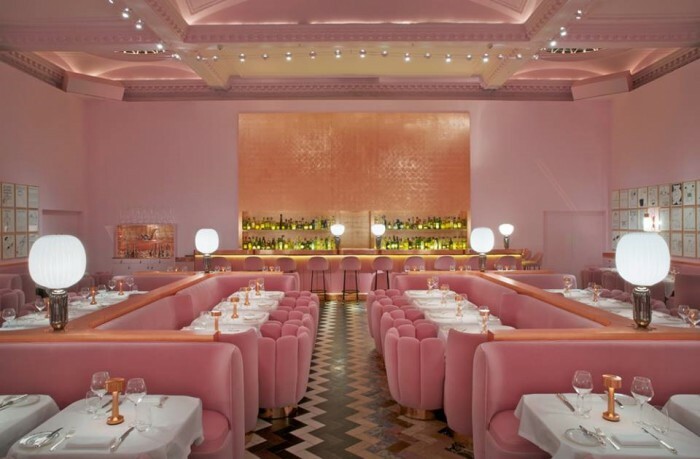 Oft-hailed London’s most romantic restaurant, this Covent Garden eatery has drawn in a multitude of celebrity couples, namely Prince Harry and his former beau Chelsea. 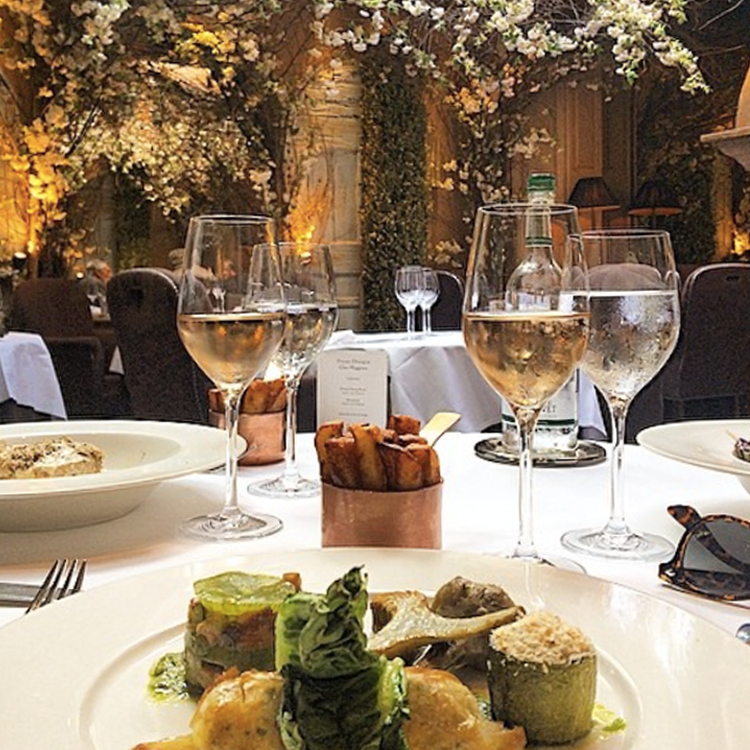 Serving up traditional French fare, the best place to propose is in the blossom-covered conservatory which is softly lit by twinkling fairy lights and candles. The conservatory even has a retractable glass roof which is wonderful in the balmy summer months. Foodie highlights include the duck foie gras for starter and the oven roasted sea bass for main. 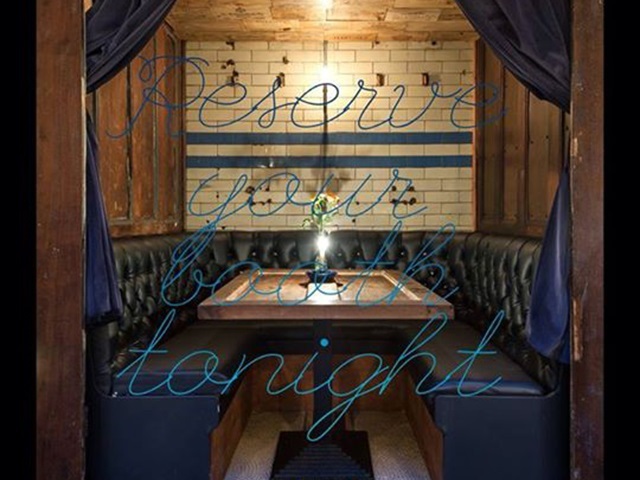 Book well in advance to secure a table at this popular restaurant. 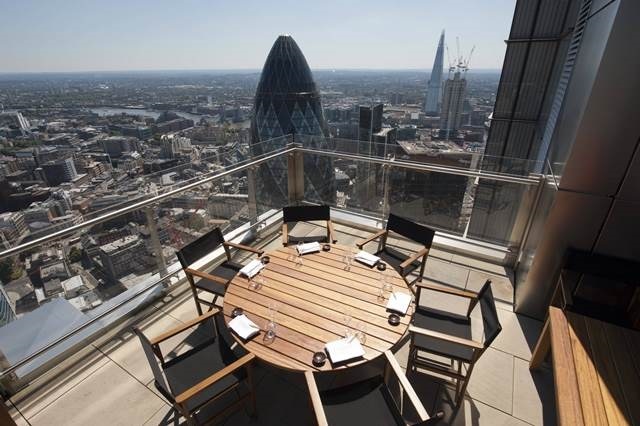 Woo your beloved at this lofty restaurant and bar, which is situated high above the city on the 39th floor of the Heron Tower. Whisk your loved-one to this stylish rooftop venue via a panoramic glass elevator, perfect for pre-dinner smooching. Featuring the highest outdoor dining terrace in Europe, this venue has wonderful views of the city. If you tire of gazing into each other’s eyes, you can look in awe at the neighbouring Gherkin, as well as the River Thames and St Paul’s Cathedral. Blending Japanese, Brazilian and Peruvian cuisine and music, this funky venue has a fabulous tree sculpture and is adorned with street art. If it’s wow factor you’re after, get down on one knee at this arty dining destination. Set within a grade II listed townhouse, the design of this cavernous venue is outrageously over-the-top. Choose whether to eat at the Michelin-starred Lecture Room or at the Gallery brasserie, which was given a recent facelift by Turner Prize-winning artist David Shringley. Walls are splashed with 239 of Shringley’s comical drawings and comfy chairs are a frothy pink. The brainchild of French master chef Pierre Gagnaire and restauranteur Mazouz, the yummy food and quirky décor will guarantee that this is a night to remember. Don’t leave without taking a trip to Sketch’s egg-shaped, space age-style toilet cubicles! Grumpy old-fashioned types won’t agree, but when it comes to pre-match build-ups Wales have won the Six Nations already. No one will top the sight and sound of the throbbing carnival they put on ahead of kick-off against England at the Millennium Stadium earlier this month. As someone that doesn’t get to watch rugby internationals as often as I’d like, that sensory overload certainly lit my fuse box ahead of a pulsating tournament opener. It was brilliantly done. These old public loos are now sophisticated drinking dens. Kentish Town is the latest part of London to open its own WC bar: Ladies and Gentlemen. Owned by Will Borell, the brother of former Razorlight frontman Johnny Borell, it’s all about the laid-back vibe here. Decor is inspired by the original Victorian features – think marble and exposed beams but you should visit for the unique drinks. Shh! To the left of the entrance to Clapham Common tube station is a stairway to the unassuming WC bar, but blink and you’ll miss it. In this case, WC stands for Wine & Charcuterie and it’s the kind of cosy nook you might want to take a date on a miserable Clapham night. 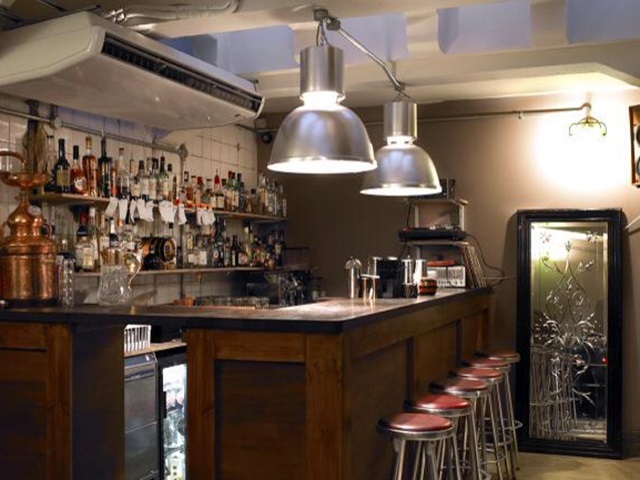 This snug wine bar also has a great menu – think salami, sourdough and olives with beetroot salad and a fine cheese selection. Yes, it’s a bit hip and you’ll probably have a bit of a wait for a table but there’s no wow-factor like an evening tucked away in one of their dimly lit booths. 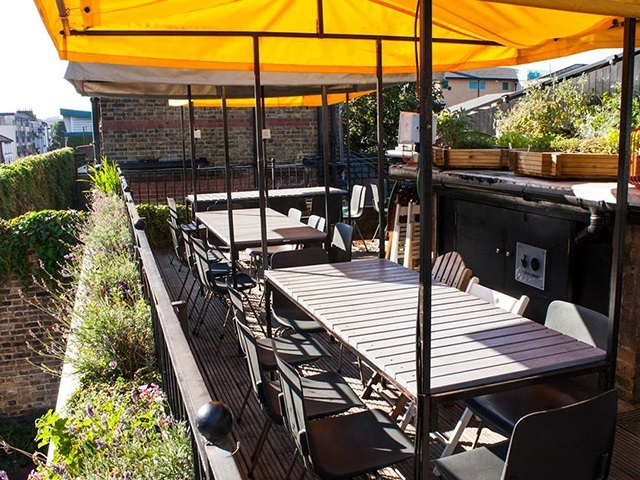 In warmer months, the bar also has a terrace with table service overlooking Clapham Common, an excellent place to people-watch with a large glass of red. Clapton is the place for The Convenience a cafe, bar, canteen hybrid that has a little more to offer than the above. The public loos they now house were empty for over 20 years, but now it’s a cool drinking and eating space with a roof terrace included. By day, eat cake served to you by local ladies (find out more about the NANA initiative here) but by night, The Convenience turns into a bustling bar offering beers, wines and classic cocktails – the reasonably-priced espresso martini, £7.50, is both delicious and potent. Dining here is definitely recommended as there’s always something new thanks to a revolving three month pop up chef system. 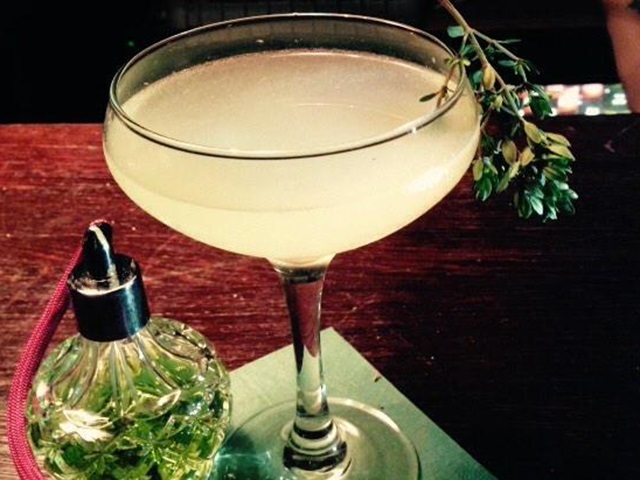 It opened less than a year ago, but already the Bermondsey Arts Club has established a firm and loyal following. 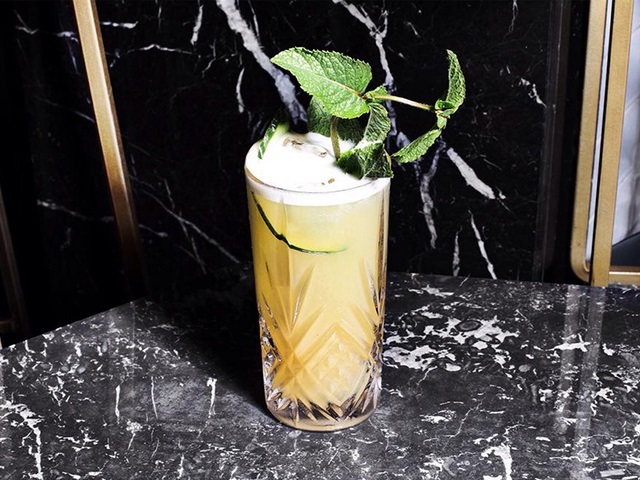 An art deco inspired jazz bar (with a side of speakeasy thrown in), this is where you can really indulge your inner Don Draper. 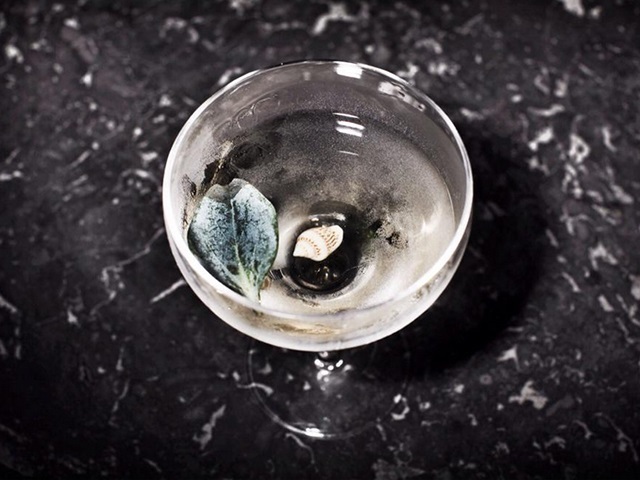 Quite simply, the drinks are works of art; Poseidon’s Reserve is sea water inspired and served with a sea shell, while Bermondsey Gardens is a refreshing muddle of apple, lime, cucumber and mint. With the Mad Men finale series starting in April, celebrate here.